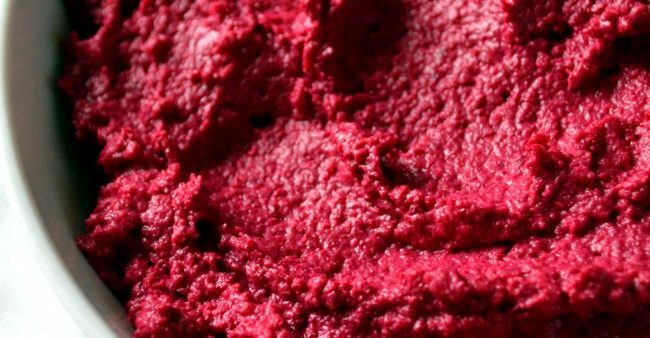 The addition of red beets to your hummus not only lends it a more festive look, but also offers a boost of nutrition. Their gorgeous pigment comes from a set of phytonutrients called betalains, which support liver detoxification, plus they have antioxidant and anti-inflammatory properties. Preheat the oven to 375 degrees F. Drizzle your beet (or beets) with olive oil – leave whole – and wrap in foil. Bake for 45 minutes, or until the beet can be pierced easily with a fork or knife. Set aside until cool enough to handle, then slip off the peel with your hands (it should come off easily). Cut the beet into quarters, then toss in the food processor and blend until they are mostly broken down. Add the chickpeas, tahini, lemon juice, garlic, salt and smoked paprika, if using. Blend again until smooth. If necessary, add a tablespoon or so of water to help things along. Sondi Bruner is a Vancouver-based freelance writer, holistic nutritionist and food blogger. She believes that fresh, whole foods contain tremendous power and are the key to feeling healthy, energetic and joyful. For more of her recipes, visit www.sondibruner.com.